Schinzel, U. (2017). What is Smart Leadership in Luxembourg? In: Vrontis, D., Weber, Y, and Tsoukatos, E. (eds): Conference Proceedings 10th Annual Conference of the EuroMed Academy of Business. Global and national business theories and practice: bridging the past with the future. EuroMed Press, pp. 1579-1611. ISSN: 2547-8516. Schinzel, U. (2017). Responsible and Smart Leadership in Luxembourg? Journal of Advancements in Applied Business Research, Volume VI Number 2, 2017, pp. 5-13. ISSN 2332-0311. Schinzel, U. (2017). Key West 2017 Florida – Sunshine State. In: Reise, reise! Ausflüge – Fahrten – Impressionen. Ausgabe 22. Frieling Verlag Berlin. ISBN 978-3-8280-3344-3. Schinzel, U. (2015). India is Market – Fascinating India, in : Reise, reise! Ausflüge – Fahrten – Impressionen. Frieling-Verlag. 2015. ISBN 978-3-8280-3286-6. Schinzel, U. (2014). Quelles compétences à l’international – Luxembourg, France, Allemagne. Frieling-Verlag. May 2014. ISBN 978-3-8280-3217-0. Schinzel, U. (2013). How to get a Doctorate – and more – with Distance Learning/Online. – Frieling-Verlag. March 2013. ISBN 978-3-8280-3128-9. World Review of Entrepreneurship, Management and Sust. Development, Vol. 11, Nos. 2/3, 2015 125 Copyright © 2015 Inderscience Enterprises Ltd. This study researches the European Union (EU), who is one of the dynamic non-state players on the world scene in relation to the crises and conflict management. As a result, it activates by voluntary conjecture of a hefty assortment of political and military roles for preventing and resolving the predicaments and clashes, which can come about in the European space or adjoining its strategic neighbourhood. This study aims to present an idea for the implementation of an educational programme to usher students towards entrepreneurship through an integrated process approach, illustrating business operations with real accounting documents and bookkeeping, using ERP and IT modelling and process analysis tools. The proposed approach will enable students to develop an understanding of the business environment and allow them to obtain some practical experience in accounting. The main objective of this research is to provide a comprehensive view of the current state of research and practices regarding the development of the knowledge-based economy: innovation as a key driver in wealth creation; how to maximise creativity and innovation in any individual, organisation, region or economy. Another objective of the paper addresses the context of how information technology (IT) can aid the transformation process of knowledge. The study of complex systems, evolutionary economics and interdisciplinary research offers the possibility of new developments. The recurrence of economic crises serves to illustrate the limits of neoclassical economics and the contemporary established models. Modern-day economic developments are highly influenced by the theory of complexity. Complex systems research represents the viable alternative for sustainable growth in the following decades. The concept of emergence represents an insightful argument against the well-planned and ordered nature of the social sciences universe. This research aims at investigating the relationship between family and products in the luxury sector, in order to understand if and how, the family affects the success of the company. 19 family businesses were interviewed, operating in the luxury sector discovering that the involvement of the family and its essence are deeply anchored in the core business of the company. Firms need to quickly and timely anticipate competitors’ next moves, monitor market tastes, adapt their products and properly communicate their positioning. Products often remain faithful to the style impressed by the family. 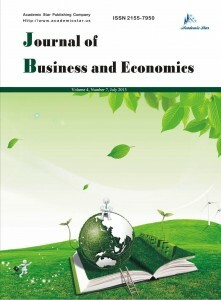 The aim of this paper is to show R&D internationalisation activities of firms from Italy in Asian developing countries. Using a dataset of 500 Italian firms with international R&D units, as well as interviews, it was researched whether companies follow a knowledge augmenting or knowledge sourcing strategy. The results show a positive relation between the choice to settle R&D units in Asia and the sale of innovative products in Asia, concluding that firms follow a knowledge exploiting strategy, establishing their whole innovation value chain to developing Asian countries. Variables influencing investment contract duration were studied by investigating the performance of mature Portuguese firms that have been (partially) held by venture capital funds. Evidence was found that sales growth, exports, book value, headcount and a good coverage of ISO standards implementation influenced the investment contract duration. The study approaches the relationship between knowledge-intensive entrepreneurship (KIE) in low-tech, traditional sectors and environmental instability from the perspective of the long severe financial crisis in Greece, of the wood industry in Greece, which led to a drastic economic downturn. The objective of this paper is to identify the indicators of a quality management model for integrated healthcare settings in Poland. In order to elicit the items and clusters of quality management, a three-step methodology has been applied: a literature review, a Delphi study, and concept mapping. This study presents a dynamic model for monetary policy. The model emphasises both the principal interdependence settled between system variables (real stock of money, rate of inflation) and the variation of these in relation to the parameters values. • ‘Different approaches to technology transfer by government and academy’ by Amiram Porath, Isabel Ramos and Hakikur Rahman The paper presents the conflict between the natural preference of technology transfer organisations (TTO) regarding commercialisation for the licensing option and the government preference for spin-offs. The purpose of this research is to investigate the cultural shifts in Hofstede’s cultural dimensions Individualism, Power Distance, Uncertainty Avoidance, Masculinity, Long-Term Orientation, Indulgence versus Restraint, and Monumentalism in Luxembourg, France and Germany. Summarising, this guest edition is an eclectic collection of papers treating current diverse entrepreneurial and management challenges and opportunities. We, the guest authors, wish you interesting reading. Abstract: Purpose: This research asks the questions “who wants digital HRM?” or “do we really want digital HRM?” with the example of Luxembourg who goes against the current trend of going digital. It investigates the cultural and linguistic characteristics of Luxembourg that may influence the tendency of human resources specialists in Luxembourg to be reluctant towards digital social networking technologies such as LinkedIn, Viadeo, Xing, Facebook and Twitter. Design: Interviews, questionnaires and case studies are used in 31 companies in Luxembourg. The author explores the extent of the use of new social networking technologies in Luxembourg. She looks at the specific political, economic and historical context of Luxembourg that impact the use of social networking platforms in the management of HR. Findings: The reluctance to use social networking technologies is related to Luxembourg’s high score on Hofstede’s “Uncertainty Avoidance”. Luxembourgish language is used as an identifier in the Grand Duchy, might represent an impediment to the extent of adoption and use of digital social networking technologies. Research limitations: The comparatively small sample size constitutes a factor that threatens the generalisation of the findings. Practical implications: Practical advice is offered to HR managers wishing to be successful in Luxembourg. Originality: The research is about new social technologies and e-HR. It tries an answer to the question, why HR specialists in Luxembourg have been reluctant to utilise new social networking technologies, considering the special cultural pattern following Hofstede. information. Storytelling is used to show and transmit values, norms, and culture, to share knowledge and understanding, it is useful in education and training, it helps to communicate quickly, naturally, clearly; with storytelling one can focus on a vision and plan the future, solve problems and conflicts, inspire continuous innovation, manage change, and make decisions. It is proposed that networking, in person and in digital form, a shared language as identifier and storytelling are capabilities for shaping the future and success of microfoundations in international environments. Conclusion and discussion, limitations, further research, and references follow. Abstract: The purpose of this research is to find out where Luxembourg fits in on Hofstede’s cultural dimensions — Individualism, Power Distance, Uncertainty Avoidance, Masculinity, Long-Term Orientation, Indulgence, and Monumentalism — in comparison with France and Germany. The design of the research is the replication of Hofstede’s study by using Hofstede’s methods: participant observation, interviews and original questionnaire, the values survey module VSM 2008 (Hofstede, 2008). Three hypotheses are offered. This is the first time Hofstede’s studies are replicated entirely in Luxembourg, providing 134 filled-in questionnaires and a full set of results for Hofstede’s cultural dimensions. The originality of this research lies in the separation into Lux.Nat. (Luxembourg with Luxembourgish nationality) and Luxembourg (including the foreigners), and the data found for Monumentalism. Implications of culture on practices, discussion and implications, future research and references follow. System a Failure or a Success Story? Abstract: The purpose of this study is to describe and explain the Luxembourgish trilingual public education system and, consequently, to determine whether the Luxembourgish trilingual public education system is a system of success or of failure. The aim is to determine whether people in Luxembourg and the rest of the world have a positive or negative opinion towards the trilingual public education system in place, or if they rather would prefer a bilingual public education system, or any other combination of languages of instruction in education. 154 questionnaires were collected and 36 interviews conducted among (1) Luxembourgers with Luxembourgish Nationality (Lux.Nat. ), (2) Luxembourg residents including Lux.Nat. and foreigners who reside in Luxembourg (Lux.All. ), and (3) the rest of the world (World). More specifically cross-cultural management theories by Hofstede et al. (2010), Hofstede (2001) and House et al. (2004), in combination with language theories by Lewis (2006), Blackledge and Ceese (2010), (Cummins (2000), García (2014, 2009), and language and management theories by Brannen, Piekkari & Tietze (2014) serve as basis for the language as identifier theory (Schinzel, 2013a). There is a high failure rate of school students who tend to not understand the language of instruction especially in mathematics, biology, chemistry, and history, and the command of the English language in schools is insufficient. The results indicate that most respondents prefer integration not separation of the population, the system should maintain its instruction in the three official languages of the country: Luxembourgish, French, German. Residents should adopt a geocentric approach residing in a multilingual and multicultural reality in Luxembourg. Some of the interviews are reprinted; discussion, implications, and recommendations for future research follow. The purpose of this study is to explain Luxembourg people’s high scores on the measure of happiness by looking into the relationship between happiness and culture, as measured by the command of a language. More specifically, Hofstede’s dimensions of culture, ‘Individualism/Collectivism’, ‘Power Distance’, ‘Masculinity/Femininity’, ‘Uncertainty Avoidance’, ‘Long-Term Orientation/Short-Term Orientation’, ‘Indulgence versus Restraint’ and ‘Monumentalism’, as well as ‘Happiness’, (Diener & Lucas, 2000) are measured and calculated by obtaining responses from 134 employees who work at Lindab Buildings in Luxembourg, France and Germany. No significant differences were found between Hofstede’s estimates for the dimensions of culture in Luxembourg and his scores for Germany, and the current study’s results for Lindab in Luxembourg and Germany. Differences were found between Hofstede’s and Lindab results for France and for Luxembourgers who command the Luxembourgish language, indicating that language is an identifier of culture. Pearson Correlations were calculated, where Happiness was found to be related to Indulgence and to Long-Term Orientation. Discussion, implications, limitations, and future research suggestions follow. Der lebendige Austausch über gesellschaftlich und politisch rele­vante Themen ist für eine Demokratie maßgebend. Deshalb liegt dem Frieling-Verlag Berlin ein offener und engagierter Dialog zu den richtungsweisenden Themen unserer Zeit am Herzen. In dem kritischen Sammelband Die großen Themen unserer Zeit • Autoren im Dia­log bekennen Autorinnen und Autoren politisch Farbe, beziehen zu aktuellen Fragen Stellung und prangern gesellschaftliche Missstände an. Dabei werden bewusst auch kontroverse Sichtweisen veröffentlicht. Der erste Teil des vorliegenden Bandes umfasst Beiträge zum Schwerpunktthema „Ist die Humanität am Ende?“ In diesem Thementeil setzen sich Autorinnen und Autoren auf formal und inhaltlich vielfältige Art mit den Grundlagen unserer Gesellschaft und unserer Menschlichkeit auseinander. Sie berichten von eigenen Erlebnissen und Erfahrungen als Helfende in unterschiedlichen Situationen, beleuchten die Situation in fernen Ländern und erörtern die philosophischen, sozialen und religiösen Aspekte der Hinwendung zum Mitmenschen. Dem schließen sich im zweiten Teil Beiträge zu weiteren gesellschaftlich relevanten Themen an. So bietet der Band einen facettenreichen Blick auf den Zustand der Welt, in der wir leben. Ursula Schinzel, Doctorate in Business Administration, studied international business, management, human resources and economics in London (UK), Paris (France), Saarbrücken (Germany) and in the USA. Since nearly 20 years she held different positions in leading American and European multinational corporations in the Grand Duchy of Luxembourg. For the last 30 years she has been sports instructor with several sport clubs and since 20 years with Sports pour Tous, Ville de Luxembourg. Dr Ursula Schinzel publishes articles and books and delivers lectures at conferences in German, English, French, Italian and Luxembourgish. Ursula Schinzel hat sich mit 45 Jahren dazu entschlossen, ihren Doktortitel in Business Administration zu machen und gibt hier ihre wertvollen Erfahrungen wieder. Auf dem Weg dorthin ist einiges zu beachten: die Wahl der Institution, die Bewerbung um den Doktorandenplatz, die Sprachprüfungen IELTS (International English Language Testing System) und TOEFL (Test of English as a Foreign Language) für Nicht-Muttersprachler, das Formulieren der Forschungsfrage sowie die Datenzusammenstellung durch Teilnehmerbeobachtungen. Die Autorin erläutert das Vorgehen bei der Datenanalyse mit der Statistiksoftware SPSS und die Anwendung von APA, eine Richtlinie zum Veröffentlichen wissenschaftlicher Texte. Hinweise, wie man seine mündliche Prüfung besteht und sich schließlich für einen akademischen Job bewirbt, gibt sie ebenso. Ursula Schinzel liefert eine beeindruckende Zusammenfassung ihrer eigenen Doktorarbeit, in der sie das kulturelle Muster Luxemburgs im Vergleich zu Frankreich und Deutschland untersucht hat. Dies geschah in Zusammenarbeit mit dem internationalen Konzern Lindab Buildings, der Produkte und Systemlösungen aus Stahl für vereinfachtes Bauen und für verbessertes Innenraumklima produziert und vermarktet. Sie bediente sich der fünf Kulturdimensionen des niederländischen Experten für Kulturwissenschaften Geert Hofstede: Machtdistanz, Individualismus und Kollektivismus, Maskulinität versus Femininität, Unsicherheitsvermeidung, Lang- oder kurzfristige Ausrichtung. Fragebögen auf Englisch, Französisch, Deutsch und Türkisch sind am Ende des Buches zu finden. Quelles compétences pour réussir à l’international ? – ou – Pourquoi les luxembourgeois sont-ils heureux ? Ce livre essaie de donner une réponse à la question: Quelles compétences pour réussir à l’international ? Il apporte un regard nouveau sur la comparaison interculturelle, initiée par Geert Hofstede, tout en la liant à l’étude sur le bonheur. La langue est vue comme identifiant au management international à travers les dimensions culturelles de Geert Hofstede. L’impact des différences culturelles sur les rencontres interculturelles est étudié. Une revue de la littérature met en valeur les recherches en matière de comparaison interculturelle Luxembourg-France-Allemagne. Les anecdotes, parfois amusantes, citées – qui pourront vous donner une impression de déjà-vu – vous montreront les implications de la recherche interculturelle sur vos décisions présentes et à venir. À l‘instar de Hofstede, on peut dire que l’identification se fait grâce à plusieurs facteurs: langue, personnalité, tenue vestimentaire, coiffure, amis, monde du travail, programmations mentales, etc. Dans la vie courante, la langue et la culture influencent nos décisions à chaque instant, consciemment mais surtout inconsciemment.